Momentum seems to be picking up in the SMB marketing automation space. Looks like we’ll have a lot to look forward to this second quarter and beyond. With that being said, it’s important to remember to keep things simple. As more and more tools hit the market and make improvements it’s going to be crucial for you to keep your setup as simple, and powerful, as possible. Also, start thinking of new ways to do digital marketing. Just as technology changed how small businesses market, the improvements to available technologies should improve how you execute your digital marketing. Pretty cool right? They started out exclusive to Infusionsoft. At the time Infusionsoft users had an ever growing list of feature requests spanning from basic to advanced functionality that went unaddressed by Infusionsoft for years. PlusThis came around and decided to take those feature requests and create a business providing them for Infusionsoft users. As time went on and Infusionsoft’s hold on the SMB marketing automation space loosened, PlusThis could no longer afford to NOT provide these add-ons for other platforms. Of which ActiveCampaign has been the last. That is where the excitement begins. Given that PlusThis was founded by Co-Founder Scott Martineau’s brother Brad (when he left Infusionsoft), the two companies always fed into one another. Even though Brad left Infusionsoft he was still able to provide a service for Infusionsoft users that strengthened the brand. To see him be willing to expand out to Infusionsoft’s top competitor ActiveCampaign shows his commitment to the SMB marketing automation space goes beyond just Infusionsoft (safe to assume this being ActiveCampaign was the last tool developed for and still doesn’t have all the add-ons available just yet). Let me pause for a second and say that Brad Martineau is one of the sharpest marketers out there when it comes to automation. I’ve enjoyed learning from him and watching the company grow and develop. The rest of my excitement lies in the additional functionality for AC users. This is a tricky excitement because a lot of the add-ons that were required for Infusionsoft, ActiveCampaign was able to do for years natively. So some add-ons won’t be as exciting for AC users as it was for Infusionsoft users when they were released. SMS Messaging – send text messages from an automation (has been native forever). Although the ability to send MMS is a good addition. PlusThis for ActiveCampaign is currently in beta and they will be releasing more add-ons throughout the month of April. I’d recommend you lock in the early bird pricing because I can almost guarantee you will eventually need an add-on or two in your business (or client’s) going forward. It’s always refreshing to see funnels built out correctly. I spend a lot of time opting into things I never have the intention on consuming or using just to test out funnels (I know I’m not the only one, right?). I was pleasantly surprised this month. As I was browsing Instagram, trying to get familiar with the platform, I was presented with an ad. It was nicely designed and the copy was good so I clicked to see if I would be impressed or disappointed. I landed on a very clean and easy to consume webinar registration page. After I registered is when I was intrigued the most. The thank you page was an additional offer for a video case study and it was delivered immediately by clicking the button on the page. The button, to my surprise, delivered the video case study via FB Messenger. I thought this was a great usage of a thank you page. It delivered immediate value as I wait for the webinar, and it gives the marketer another channel to message me on. Plus, since I had to be on Instagram to see the ad, there’s a good chance I have a Facebook account as well to get access to the video series. Can’t imagine this same funnel working well with Google Adwords traffic since you can cast a much wider net with your targeting. Nonetheless, this is a funnel I’ll be testing and monitoring myself. I’d recommend you do the same. Drift, along with Intercom, are two of the top onsite chatting solutions. If I were Intercom, I’d be watching closely. Although they just raised some funding, Drift is coming swiftly (see what I did there?). They recently added the ability to send emails. It is being called “Conversational Email Marketing” (which I think is really smart). This makes their offering practically a 1-to-1 with Intercom. 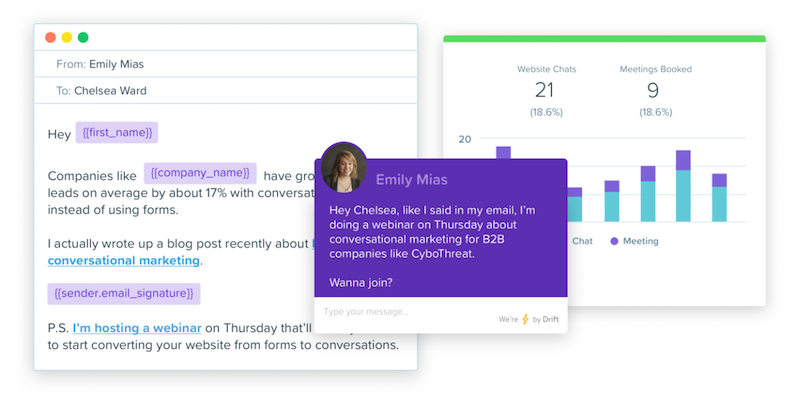 Drift has already been gaining a lot of momentum and you will find a lot of websites now, of all sizes, using Drift as a chat tool. So it makes perfect sense to me for them to offer email abilities since you can capture emails and other information with their tool. Plus, David Cancel is dialed in to not only his product but developing a strong team around the product. Which can go a long way for any company. Also, with him being on the board at Drip I wonder if there is, was, or will be some IP sharing around email sending and potentially a visual builder inside of Drift. Or maybe a more tightly coupled offering or partnership between the two tools. It will be interesting to watch how things develop. Virtual cards changed the way I pay for my services in my business (and soon to be personal life too). 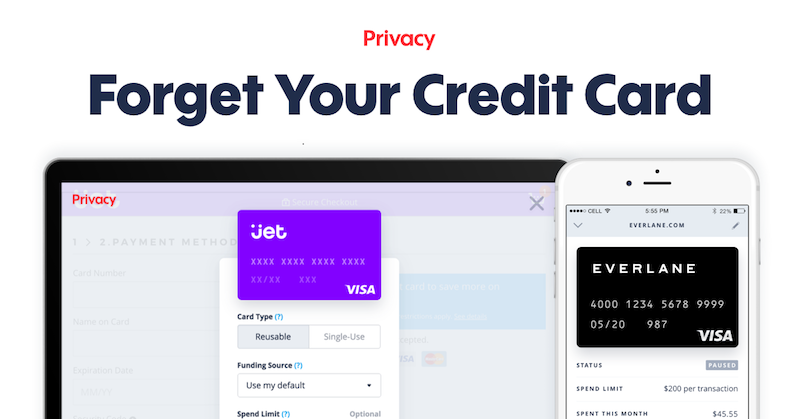 I heard about virtual credit cards from Privacy.com before but never really understood why I needed them. The more I learned the more apparent it became. Virtual credit cards are digital credit cards primarily used for online buying. They must be connected to a bank account and can be used as a regular card. Where it gets interesting is you can set limits to how much can be charged. You can even set monthly limits. For instance, let’s say there is software you’d like to try. It has a $1 trial period that automatically converts into monthly payments. You can setup a virtual card with a spending limit of $1 and rest assured that if you forget to cancel your trial your virtual card will reject any transactions over $1. You can setup as many virtual cards as you like and Privacy.com even comes with a Chrome plugin. These cards are great to add and extra layer between your online spending and your bank account. Sometimes I truly feel like a broken record when it comes to explaining the difference between email marketing, email marketing automation, and marketing automation. And it’s always somebody, or some company, that comes around and reminds me of the need of education in this area. This month it was Moosend. I received an email from them asking me to swap out a broken link to an old Mailchimp article with a link to theirs. I normally ignore these types of requests sent via email. but I was in a good mood this month and decided to check out the article. The article itself wasn’t bad…the companies’ positioning, however, was another story. Didn’t take long before I realized they were an email marketing platform, email marketing automation at best. Which is good because they seem to have a nicely designed platform. They made the fatal flaw of comparing their platform to ActiveCampaign. However, they lost all credibility with me when I looked at their comparison pages. They made the fatal flaw of comparing their platform to ActiveCampaign. All I could do is shake my head. When I went and read the comparison all it talked about was automation around sending emails. No CRM, no internal notifications, no automation that does not result in an email being sent. This is the same issue I have had with Drip in the past as well as Mailchimp. They try to make their tool look bigger and better than what it is by comparing themselves partially to tools who are bigger and better than they are. Although I feel Drip has shifted their focus a bit to be more consistent with their platform’s capabilities, Mailchimp is still a top offender claiming marketing automation. Moosend has put themselves on notice as a top offender as well. Marketing like this is not only inaccurate but it’s also hurtful for the end user. Business owners that don’t know better bite on the promise of marketing automation and in time when they’re needs grow to needing true marketing automation they are burdened with a migration. 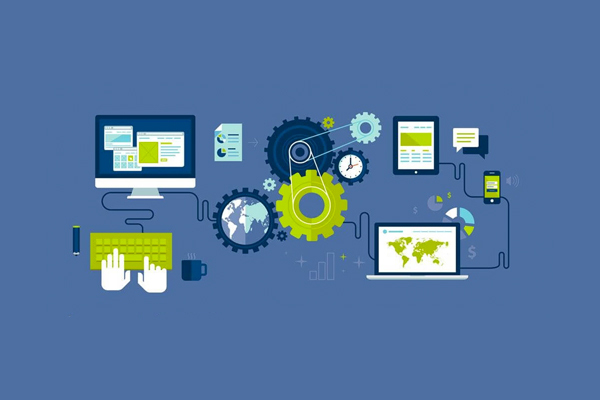 Instead of choosing a marketing automation platform to begin with that is capable of growing with their business. Shame on you Mailchimp, and shame on you Moosend (your earned the title “Boosend” for the month). Andy Jenkins, Mike Filsaime, and Russell Brunson should talk. If they haven’t, of course. Because I see Andy and Mike making the same, if not worse, mistake as Russell made. The Webinar Jam team just launched Karta. An all-in-one marketing automation solution. While the space is moving more towards decoupling apps and using technology stacks to run their business, Kartra runs the other way into the past. Listen, it takes years to build a solid email marketing platform. Even longer for a marketing automation platform. There are simply no shortcuts. This is the reason why I’ll never use a new, untested, tool for my marketing automation needs. That being said Andy and Mike had to have known what journey lies ahead. And maybe, to their credit, they’re playing the long game. Either way I don’t have faith in it working. A couple years ago Russell Brunson added Actionetics to his ClickFunnels offering. It was originally positioned as the “Infusionsoft Killer”. Needless to say it did no slaying of Infusionsoft at all and a lot of ClickFunnel users still prefer to use separate marketing automation tools. Since this realization, you don’t hear a lot or buzz about the tool. It’s sort of confined to the inner ClickFunnels community. I haven’t even been able to find a sales page for it. But let me give some credit here. It’s really smart that they have leveraged a lot of the IP from their webinar tools. At least they are not starting from scratch. From the webinar attendance conditional automation to the landing page builder, it’s all proven tech. Truth be told they’ve been testing additional capabilities for years and are now confident with releasing it to the public. Not good enough to convince me. I’ve seen this jack-of-all-trades approach before and it has its limits. Just ask Infusionsoft. Time hasn’t made that better it has made that worse. Karta is simply trying to do too much. They’re trying to be to tool to handle ALL your marketing needs and beyond. Lofty goal nobody has been able to achieve. For that reason I can’t even contemplate thinking of potentially using them (yup I said it just like that on purpose). Not to mention when I signed up for the wait list I received two sales heavy emails within 1 hour. I hate that type of in your face marketing. I do wish them the best of luck in their journey and all they will learn along the way. If you have some extra time to try out the new platform and are bold enough to use it in your business I’d love to hear your feedback below.